Thanks to everyone who made this our biggest and best year yet! If you couldn't make it, click here to read more about what you missed. Come see Car-Part's product roadmap and how you can position yourself for greater profits in this rapidly changing industry! Our completely integrated suite of products simplifies your jobs and avoids duplication of effort: from buying salvage through inventory management, warehouse management with Real Time Barcoding, internet sales, brokering, production, and business management reports. Learn how our suite works together and become an expert on the tools you use every day! Where else can you get time with the people who actually design and build the features you rely on? Specialized Trainers will give you the individual attention you crave! Become an expert on our exciting new features so you can return to your business and immediately use them! Simplify your customers' ability to buy the correct part from you without having to answer complex interchange questions. Learn how to customize Order Trakker and simplify your production process. Join our Roundtable to compare your metrics with non-competing recyclers. One-click access to OEM pricing and interchange information. Plus many more new and existing features you might not be aware of! Learn which services you can offer to be the preferred parts supplier for collision shops and appraisers and how you can provide them through Car-Part Pro! 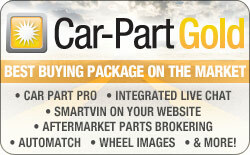 Effortlessly sell extended warranties and delivery and broker parts on Car-Part.com! Bring your key staff so they can be trained and master individual tools. See what attendees had to say about the 2010 conference. "This event is a great asset to any recycler. Big yard or small, new or a long-time customer, Car-Part.com gives you the attention you need." "I like the fact that Car-Part.com is always innovating and trying to keep us yards on the cutting edge."